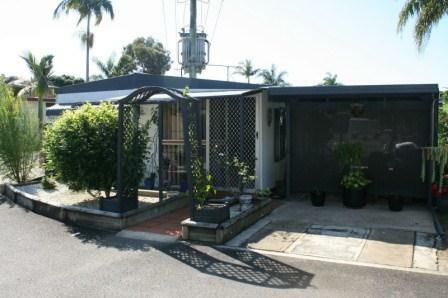 A home for just $42,500 at the Drifters Holiday Village in Kingscliff! This charming home is situated on a corner block close to the entrance to the village and all amenities. This neatly presented home may be enjoyed as is, or may benefit from some future renovations. Open plan kitchen/dining area with adjoining lounge. The dining area leads to the bedroom that currently has a double bed with built-in robes. The lounge area has been partitioned to provide a second bedroom that leads to the bathroom consisting of shower, vanity and toilet. The home has an entrance porch, gas-fired hot water service, single carport and garden shed with laundry facilities.